GM's North American operations during the quarter earned more than $3 billion, up 5.7 percent. DETROIT — General Motors swung to fourth-quarter net profit of just over $2 billion, as strong North American results offset restructuring costs and losses in its international operations and autonomous-vehicle unit. The fourth-quarter results compare to a year ago when the company reported a record operating profit of $3.1 billion but a net loss of $4.9 billion, due primarily to U.S. tax reform. Those results were based on continuing operations, after the company's sale of its European operations. The company spent $1.3 billion on its ongoing restructuring in the fourth quarter, primarily employee separation charges and accelerated depreciation. GM, according to CFO Dhivya Suryadevara, expects to spend roughly $2 billion in cash overall for such actions. For the year, net income swung to about $8 billion from a loss of $3.9 billion in 2017. GM shares rose on the report, gaining 1.5 percent to close the day at $39.91. The shares earlier in the day had topped $40. In the fourth quarter, GM's adjusted earnings, before interest and taxes, decreased 8.3 percent to $2.8 billion, and its global margin declined 0.8 percentage point to 7.4 percent. Revenue increased 1.8 percent to $38.4 billion. For the year, the automaker's adjusted earnings, before interest and taxes, were down 8.3 percent to $11.8 billion from 2017, while income from continuing operations increased to $8.1 billion from $348 million. Suryadevara described the results as “strong,” despite outside commodity pressures, foreign exchange challenges and a volatile trade and political environment. 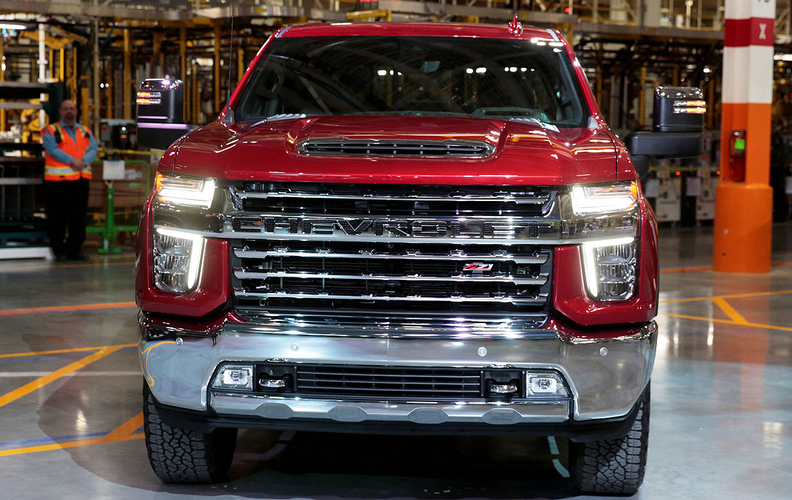 GM, she said, was negatively impacted more than $1 billion due to negative changes in trade in 2018, however the company was primarily able to offset those costs. The first quarter of this year, according to Suryadevara, is expected to be the weakest for GM. That includes an expected 25,000-unit loss to its full-size SUVs – primarily in the first quarter – due to downtime at its Arlington Assembly plant for retooling for the next-generations of the vehicles in 2020. GM last month advised that it would exceed its previously reported guidance of adjusted earnings $5.80 to $6.20 per share and automotive free cash flow of $4 billion. It delivered on that promise. For the year, GM reported earnings of $6.54 per share, including $1.43 in the fourth quarter – topping Wall Street estimates of $1.25. The company's free cash flow was $4.4 billion for the year, excluding the impact of an expected $600 million payment to non-U.S. pensions in the third quarter. For 2019, GM previously forecasted earnings of $6.50 to $7 per share and adjusted free cash flow between $4.5 billion and $6 billion. “We are really repositioning this company from one that was trying to be all things to all people in all markets to a very strategic, agile and profitability company and we believe we are in a very differentiated position than many of the competitors in this industry,” Barra told investors. Additional headwinds hindering its results for the year could include a flat to lower market in China and a potential contentious collective bargaining with the UAW in the second half of the year. North American earnings increased 5.8 percent to $3 billion in the fourth quarter. GM on Feb. 22 expects to pay up to $10,750 in profit sharing payments based on North American earnings to UAW members, down $1,000 from $11,750 in 2017. The company's international operations lost $48 million, down from earnings of $416 million in 2017. GM Financial reported earnings of $416 million, up 38 percent from $301 million a year earlier. Fifty-six percent of GM’s sales in the fourth quarter were financed through GM Financial. Operating profit margin: The North American margin for the year was 9.5 percent, including 10.2 percent for the fourth quarter. It was the first time since 2014 that the company’s profit margin for the region dropped below 10 percent.